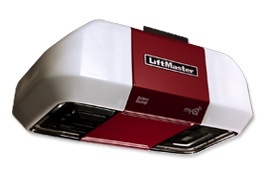 The LiftMaster® 8550 garage door opener provides optimal security and convenience for you and your family. If you are concerned about noise, you will appreciate this model’s quiet soft-start and slow-stop operation which makes it ideal for garages located under or near living quarters (such as “mother-in-law apartments”). In the event of a power failure, you can depend on this door opener’s built-in battery backup that ensures the door (including its safety and security features) will function normally. For additional convenience, the LiftMaster® 8550 features MyQ® technology, which allows you to access the mechanism via computer or smartphone, so you can close the garage door and turn your lights on and off from any location worldwide. Best Garage door motor ever!